Our Lingcod fillets provide a quick premium dinner for your family that is easily complimented with your favorite seasonings. If you are planning an intimate dinner for two our Lingcod fillets have an unbeatable taste when baked with your beloved spices. Product is shipped raw with no breading, preservitives, or additives. Our Lingcod fillets provide a quick premium dinner for your family that is easily complimented with your favorite seasonings. Make your dinner sizzle with our Lingcod as a lean low fat meal on the grill. Invite friends and family over for a scrumptious barbeque that is flavorful and healthy. Serve Lingcod fillets with a bottle of your favorite wine and you have a exquisite meal for all to enjoy. If you are planning an intimate dinner for two our Lingcod fillets have an unbeatable taste when baked with your beloved spices. Lingcod fillets are packaged in one-pound gold foil vacuum sealed packs to keep them at their freshest until you are ready to serve. 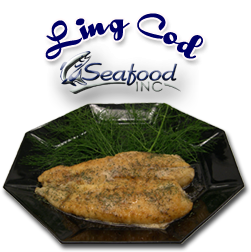 As a fresh ling cod supplier we ship fresh and frozen ling cod worldwide. Seafood Inc is dedicated to superior quality of its frozen and fresh ling cod.